THE UNEMPLOYED EATER: Update. The Very Good Blue Star Donuts Opening 10/21 on Abbot Kinney. FREE Donuts 10/19. Update. The Very Good Blue Star Donuts Opening 10/21 on Abbot Kinney. FREE Donuts 10/19. UPDATE (10.13.15): Blue Star officially opens their heavenly brioche donut doors on AK Wednesday, October 21st. If that isn't exciting enough, even better news: on Monday, October 19th, they will dole out free donuts starting at 9 am. On offer: their signature Blueberry Bourbon Basil and a new LA-specific, Pina Colada (pineapple, coconut, rum and mint-flavored cake donut topped with shredded coconut). Once the store commences in full, the PC will be joined by other Blue Star classics and LA only flavors like Greek Yogurt Honey Granola, Strawberry Shortcake and Mimosa. Blue Star will be open daily, 8 am - 10 pm (or until doughnuts last). 1142 Abbot Kinney Blvd, Venice. Los Angeles is beginning to be spoiled by other city's top doughnut franchises. Especially the Westside. 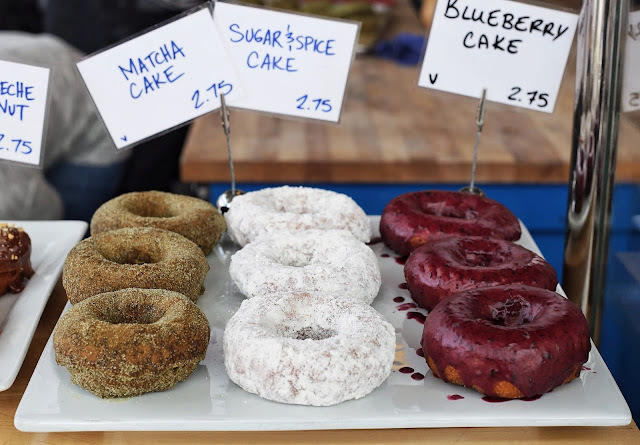 First came whisperings that Orange County's scrumptious SideCar Doughnuts planned to set up shop in Santa Monica (when exactly remains to be seen) and now, via carrier pigeon up north, comes word Portland's awesome/delicious/creative/very-Portland Blue Star Donuts plans to open in Venice. Not just anywhere in Venice either, but rather right in the heart of the ever-glitzy and popular as all get out Abbot Kinney. As is the trend for nouveau doughtnutteries nowadays, the plan is for BSD to be open almost all day, so you can fulfill your 'nut craving both day, night and afternoon. Aside from a few LA-specific varietals, expect the very well-received flavors from the Portland locations; for example, I've been told by more than one individual they would legitimately murder to get their hands on the shop's Blueberry Bourbon Basil. For LA and the Westside in particular, this is another culinary victory. It also stands as a further example of strong, almost cult-like food concept imports desire to enter the southland marketplace. Should set up quite a doughnut tug-of-war between the foreigners (Blue Star and SideCar) and the locals (Donut Friend/The Donut Man/Donut Snob, etc). I'm game to sacrifice my body to help settle the duel. You should be too.